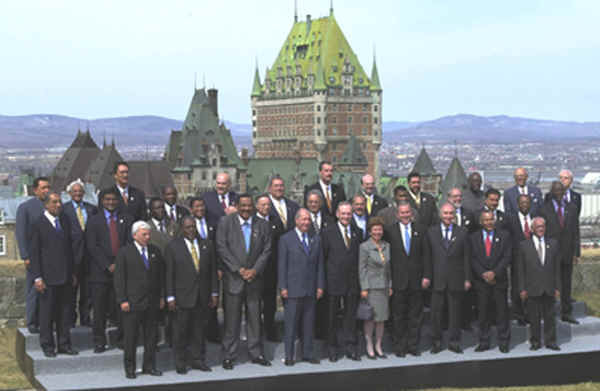 In 2000, the countries of the hemisphere began the preparations for the Third Summit of the Americas, held in Quebec City, Canada, April 20-22, 2001. The Summit emphasized 18 themes resulting in the adoption of 254 mandates on issues including Democracy, Human Rights, Justice, Hemispheric Security, Civil Society, Trade, Disaster Management, Sustainable Development, Rural Development, Growth with Equity, Education, Health, Gender Equality, Indigenous Peoples, Cultural Diversity, and Children and Youth. The Declaration and Plan of Action of Quebec City adopted by the Heads of State and Government represented an agenda for the Americas for the next four years. The Quebec City Summit was notable both for its demonstration of the successes of the Process to date as well as for its new challenges to the countries of the Americas to continue moving forward. The most important issue from the political Declaration was the preparation of an Inter-American Democratic Charter to reinforce the OAS instruments for the active defense of representative democracy. The Charter was adopted on September 11, 2001, in Lima, Peru, in a Special General Assembly of the OAS.